EMBODYING EMOTIONS: Sabke 'bus' ki baat nahi....Degrading DTC scenario! 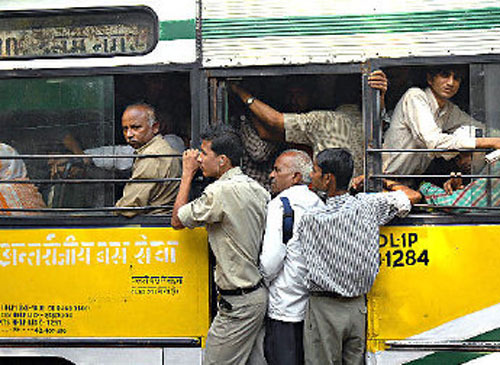 Sabke 'bus' ki baat nahi....Degrading DTC scenario! We all have read these few yet extremely eloquent lines in our kindergarten days but growing up shoulders on bigger responsibilities and somewhere these untold gestures loose relevance in between the pages of a moribund book called 'life'. 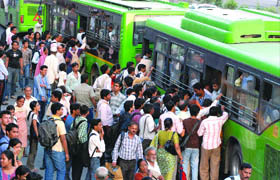 I happen to be a daily commuter of DTC buses. Now, Delhi is a busy city. in fact, this is an understatement. its bustling with a huge flock of people running anxiously in all directions , at all destinations , all the time. yes, that's how it appears to be. Morning and afternoons being the worst case scenarios ,with a population mounting up to a whopping 1.67 crore no wonder the buses are scanty in number and the number of commuters running hysterically behind each one of them 'to edge' a place are manifold. this is a routine commuters life in DELHI! And thanks to the 'phasing out' of old buses and bluelines the situation has degrade to the level of new 'low floor'. These red and green (and recently started orange) buses happen to be wider with automatic doors no doubt but what purpose they are to serve when those rash impulsive drivers speed them away in a 'devil may care' attitude while an old crippled lady stands helplessly for hours on the bus stop? Let me add to your knowledge that the campaign for these giant size , low floor buses were initiated in order to favour the elderly and crippled citizens. Pedestrians were laid down and there were talks of providing wheel chair service too. but what is the use of such campaigns and promotions, when the drivers, the very in charge of this running system are ill mannered and ill practiced? the bus that should be stopped centimeters away to the bus stops is distanced metres away and at times not halted at all. They are sped away mercilessly while a young school child strangles with a foot in air. It is this inherent disregard for the value of human life , upbringing to various precautions, it is this numbness to everyday chaos that actually holds away the very finger of the bus driver for the door to close and bus runs away. To top it up , our system puts up a material gloss on its insufficiency and thereby brings momentary false hopes not just to its citizens but also gives a pseudo emerging India picture! The internal diagnosis would reveal how crippled we are in our thinking..no really!! forget about those unsaid , unselfish acts of kindness, we are unable to even handle our own jobs honestly! when I see commuters blindfold themselves to this and many such mal practices each day, it instantly crosses my mind as to what purpose is our knowledge serving? We are so ignorantly busy in creating a heaven for ourselves without giving a a thought to the fact that what roads are we taking..will it really 'make our world a better place' or would it bring us to a 'hell unknown'? I’m trying to find myself in this business of crowd, person who is least busy is me, I think so. Low floor is a pain. It has an epic fail ventilation system and little more than excessive crowd makes it sick. Its as if we are participating in the Olympics - empathy, consideration for others be damned. only time i personally travelled by bus was in Mumbai BEST n d service dere is excellent to d best of my knowledg. in chennai i hav only cn hw it is n sounds much d same as uve mentioned up here or mayb even wrs. bt wats most disturbin is d fact dat a bus driver who runs over a person cn get away wid a fine of 500 bucks!!! jus imagine. dats d value of a persons life!! We all are creating lives for ourselves good or bad, but somewhere in this blind race to reach where we think we are headed, we forget that we are humans. Let's try to remember it, for once. BEST is still the best....the bus services else where is a very sad story...:(...true competition, needs have stolen humanity...facts of life matter wen we stay 'HUMAN' n not machines for race..
Thankfully, Busses in Kerala are not crowded enough to Kill! I've never had much experience with public transports except 2-3 times and they were all about what is said about them. thoughtful post.. and it happens everywhere..
DTC buses are insanely overcrowded..I traveled through these buses twice and then i couldn't collect the guts to board on the same..i moved to metro trains n not very surprisingly..the situation is worsening there too..Delhi public transport system needs lot to be done! DTC buses in Dehli are life takers..I dunno what it stands for but for me the D is Death, and I'm glad Mumbai has BEST and gladly it is the best... in fact here we even have train services so somewhere its better...yet the buses are nevertheless over crowded! Its bad to hear..people don't value human life...some die in bomb blast or like this..either way people suffer!